SMOKE SHELLS explode near the top of the Camino-Maggiore hill mass near Mignano. Division attack on December 3 worked up the ridge on the right and continued on over the top and beyond to the right. Long supply trail rose on lower slope. 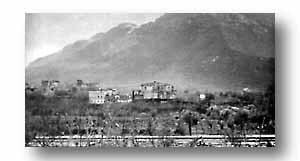 On November 15, the 142nd Infantry moved into defensive positions on the lower slopes of the Camino-Maggiore hill mass, 3,000-foot bastion guarding Mignano Gap. Hardships on the Texans increased as continual rains turned the mountain-side into a slippery, treacherous obstacle. Advantageous hill-top positions clung to by the Germans gave the enemy full observation of the valley. For two weeks preparations for a big attack were under way. Supplies were packed by hand to forward dumps high on the mountain slopes. Patrols felt out the German positions. Men came down from the rocky ledges briefly for Thanksgiving Day turkey. A week later, after dark of December 2nd, 600 Allied guns in the valley began the greatest artillery concentration since El Alamein. This artillery expenditure earned for the target the popular name of "Million Dollar Mountain." 36th DIVISION ARTILLERY booms out in preparation for the attack on "Million Dollar Mountain." It was one of the heaviest concentrations of the war against strongly fortified enemy positions. Some 600 Allied guns participated. Before daylight the 3rd Battalion crossed the line of departure half-way up on the eastern ridge. The attack proceeded swiftly, Lt. Col. Samuel S. Graham's 2nd Battalion moving through the 3rd when the latter's objectives had been seized, and pushing forward over the rock-cleft top to the most forward slope, a point 4 kilometers on a straight line from the start. By late afternoon Maggiore had been seized but the enormous problem of maintaining the position over the extended single line of supply had only begun. Heavy German artillery pounded back on the newly-won positions and on the supply trail. For another week, with more rain falling, our men endured the muddy holes and the enemy shells until a relief was effected. 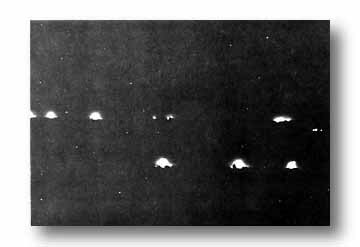 An attempt, then novel, to drop supplies by fighter plane to the men on Maggiore, missed. The Germans got the K-rations. 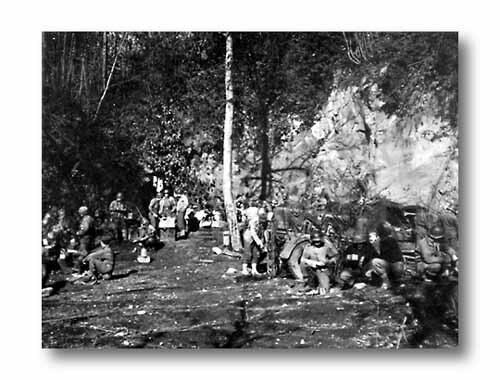 TROOPS BREAK AWAY from C-rations for a hot meal in a stream-bed just below Mt. Maggiore. Usually men refrain from bunching up but here heavy rock cliffs offer protection. This might be Thanksgiving Day turkey.